The Northfield Area of Commerce sponsored a forum this morning at the Community Resource Bank‘s Community Room. Purpose: "… for local employers, property owners, and our city government leaders to hear from each." See the agenda screenshot on the right. Click play to listen. 1 hour, 21 minutes. Or download this MP3 for listening on your computer or portable audio device. Kudos to the Chamber Board for opening up the forum to all local employers and property owners, not just those who are Chamber members. Griff: We are hoping that property owners and local employers who aren’t members can see that the Chamber works hard and returns value for the costs (investment). We also thought that the City Council should see that it isn’t just the Chamber that is concerned about these business concerns. Don’t be surprised if someone is asking you to join. Nfld News story posted at 12:36 pm: Business owners, city officials mix it up at Chamber forum. “It was our feeling that lots of things are happening at the city, and Chamber members are not always consulted; they are informed,” said forum moderator David Ludescher. 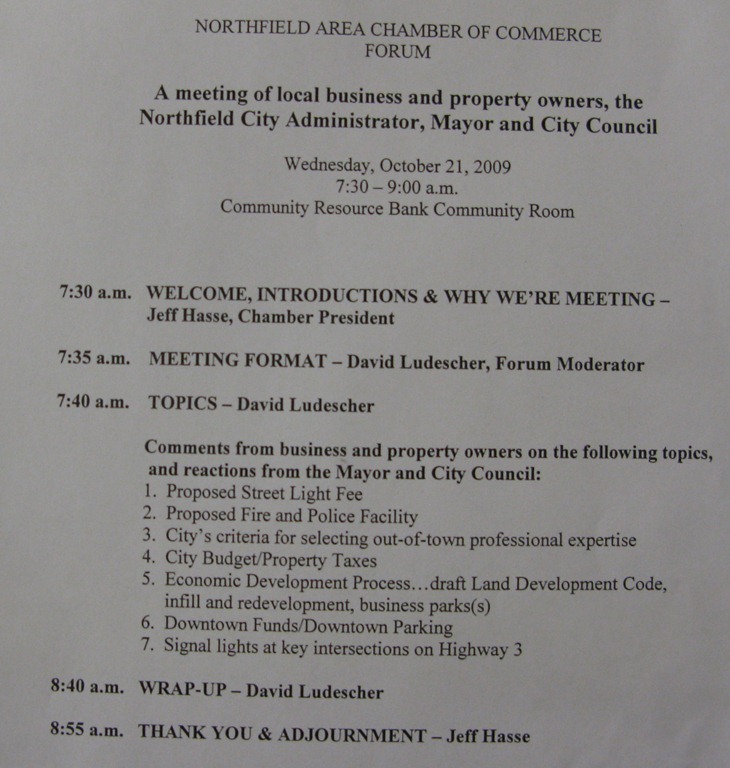 City staff and elected officials were allowed to briefly respond to the remarks, but informal votes showed most of the audience were against city policies that would increase local taxes, like the proposed charged on property owners to recoup the cost of lighting streets used by residents, employees and customers in Northfield. This meeting began with IMO a very bizarre statement by Mayor Rossing, who stated that in observance of the open meeting law, two of the councilors at the front table would leave and sit in the audience, leaving less than a quorum. (Cs Pokorney and Zweifel were not present) The Mayor said they had been advised by counsel that this was necessary, because the meeting had not been noticed as a public meeting. However… there was no decision making by the council here, there is no way it could possibly be described by any extension to be a ‘legislative’ meeting ; it was, in fact, said to be a ‘listening opportunity’ for the Council. There was a very large turn out; the meeting room was full with people standing around the edges. I have never, in ten+ years, been to a meeting of this sort that was so well attended. Some of the discussion centered around the property tax issues for commercial business and building owners; there was an air of condescension in the Mayor’s remarks as she reminded commercial property owners that the city does not control the tax rates, those are set by the legislature. I am sure that most if not all commercial property owners are very, if not overly familiar with their tax bills; lecturing about that tax structure is not needed. Indeed, it must be said that the NDDC has been working for years on the commercial tax structure issue, and had gotten as far as draft legislation for the legislative tax committee , when the current economic/revenue problems of the state shut down any hopes, for the time being. The business people there were hoping for some understanding of peripheral problems with the City’s process, as it relates to business development, and some acknowledgement of help with problematic areas of interaction that the City does control. It was suggested that meetings like this be regularly held, several times a year; an excellent idea. There was very little heat or “mixing it up” – I’d call the interaction yesterday very mild. Kiffi, I disagree that Mayor Rossing was being condescending about the tax issues. The Council is acutely aware of the impact our decisions make on commercial property and the virtually empty toolbox we have to try and fix the disparity. The NDDC’s lobbying efforts should be commended and the City should increase its own pressure in this regard. The development process complaints are most troubling to me since I’m at least waist deep in the development regulations update. We can create better regulations (and we’re trying), but the Council needs to convey to staff that the commercial development process must be easy, quick, friendly, and predictable while still regulating those things the City wants to control. Bravo to the Chamber for holding this forum – the turnout was impressive and I’d urge members to speak out – if not in a public forum, then by contacting individual council members. Council members cannot usually change policy or procedure quickly, but we can take your concerns to the whole council and to the staff and ensure the issues stay on the agenda. Betsey: The Chamber called the meeting because many of our members are contacting us about their concerns. What you heard at the meeting was muted. The broad message was fairly consistent – Control costs, cut back on expenses, reduce services if necessary, and be partners, rather than obstacles to businesses. Now is not the time to plan grand structures like a new Safety Center, library, or other amenity. Stick to the basics. Don’t tell businesses, ask us. I would say that the Council is taking heat for the attorney decision, and the City’s tendency to hire experts and consultants from out of town. The decision is a “suburbanization” of Northfield. I thought what was expressed at The Chamber by the 100 or so people who attended was expressed very well by the vast majority of those who sat in silence; speechless outrage. After talking to some of the Council members, reading Betsey’s blog, and listening to Jon’s interview, I don’t think the Council understands the depth of the frustration of businesses. We are in a recession. Stop talking about building a new Safety Center, bike trails, and other things that aren’t absolutely necessary. Focus on building a strong community. Give a special focus and consideration to business, which is probably the hardest hit segment of Northfield. Hopefully, there will come a day when we can once again consider the amenities. But, today is not the day. 1. Is the decision to tear down the current facility permanent, or what may cause a change? Has the City checked with the DOT to see if we can, for certain, get another access from Highway 3? 2. Would the Mayor, City Council, and/or the City Administrator welcome a Chamber Task Force to help look at the options? 3. No matter the options or what is determined, how will we pay for the new facilities? 4. Is there any reason not to have a referendum on this issue? What are the pro and cons of a referendum? 5. What are the current agreements with the townships and Dundas for fire protection? Are the surrounding partners willing to share in the additional costs? Has Northfield talked to them about this decision? d. Keep the fire there. Presentation: A financial overview of our city operations. Where does our revenue (at least the majority) come from? State funding? Business RE taxes? Residential RE taxes? City’s expenses? 1. Explain the levy and how it impacts taxpayers…what projections have been done, and what are the ramifications for residents and businesses? 2. What specific budget cuts were made in 2009 and proposed for 2010? How much is this total and what percent of the total budget? 3. Explain the shifting of funds that has been done and planned for 2010…for example the EDA Director’s salary/benefits. 4. What tax and fee increases have the Mayor and City Council approved or considering? An example is the Street Light Fee. 5. What are the city’s investments and rates? 6. Explain our bonding process and how it works. Nfld News: City pitches public safety projects to Chamber. The centrally located Safety Center site is preferred for a new fire hall, City Administrator Joel Walinski said, because it would not lengthen response times, and would not require Hwy. 3 access to make use of drive-through equipment bays. Mayor Mary Rossing said public safety demand decades from now will call for a satellite fire location and an police facility footprint larger than would fit between the streets and river that bound the Safety Center site.